Notre ferme, construit en 1900, est situé dans une vallée sur cinq acres dans la région de Lost River. Nous décrivons son style comme "moderne et rustique," ce qui signifie qu'il conserve beaucoup de son caractère séculaire, mais a été rénové dans un loft avec une fenêtre de deux étages donnant sur le pâturage, une grange et les montagnes au-delà. Le premier étage dispose d'une salle à manger et salon, cuisine entièrement équipée, salle de bains, buanderie et une chambre avec un lit queen-size. La salle à manger ouvre sur une grande terrasse qui donne sur les montagnes. Il ya un feu de camp, barbecue et transats, parfait pour se détendre avec une tasse de café le matin ou un verre de vin dans la soirée tout en admirant les étoiles étonnantes qui sont visibles sur une soirée claire. La cuisine ouvre sur une véranda-in avec une table et des chaises. Le deuxième étage a un loft de salon qui donne sur la salle à manger et la fenêtre de deux étages et est meublé d'un canapé et de la télévision. Il y a aussi une deuxième chambre avec un lit queen-size. La salle de bain a une baignoire sur pattes avec cabine de douche. Le luminaire est un lustre. My dog and I just spent a 4 day holiday at the farm. It was the most perfect, relaxing retreat and exactly what I was looking for. It was a bit cold the first two days, but we warmed up nicely with the wood stove and many space heaters provided. We took advantage of the beautiful state park just a few miles away, and hiked the White Oak trail up to Cranny Overlook. To say the views were breathtaking is an understatement. If you are considering planning a visit here, DO IT! You will be glad you did. I cannot wait to go back. A charming, rustic, and ideal farmhouse retreat! For the tl/dr version: As we begrudgingly checked out after a two night stay without ever leaving the property, we immediately began plotting a return trip. The details: I could not imagine a more ideal retreat from a busy city life that combines all of the creature comforts (WiFi, modern appliances, etc.) with a sense of history in a rustic setting. Whether it was waking up under a pile of warm blankets and catching the sunrise through the large farmhouse windows, strolling around the property with my inquisitive labrador in the afternoon, or watching the sun cast its shadows along the rolling hills each evening, there wasn't a moment we didn't thoroughly enjoy. While the temperatures dropped well below freezing during our late-January stay, we kept the wood-burning stove stoked (firewood provided) and the house warmed to a comfortable temperature... and enabled me to test out a delicious chicken & dumplings recipe in my dutch oven (thanks for the epic apron, haha!). Eric was very responsive to any inquiries and provided all of the information necessary to have an enjoyable stay. This is now my go-to location for a romantic getaway, a working retreat, or (in this case) both! I had the good fortune recently to book a week to myself at Cold Comfort Farm. 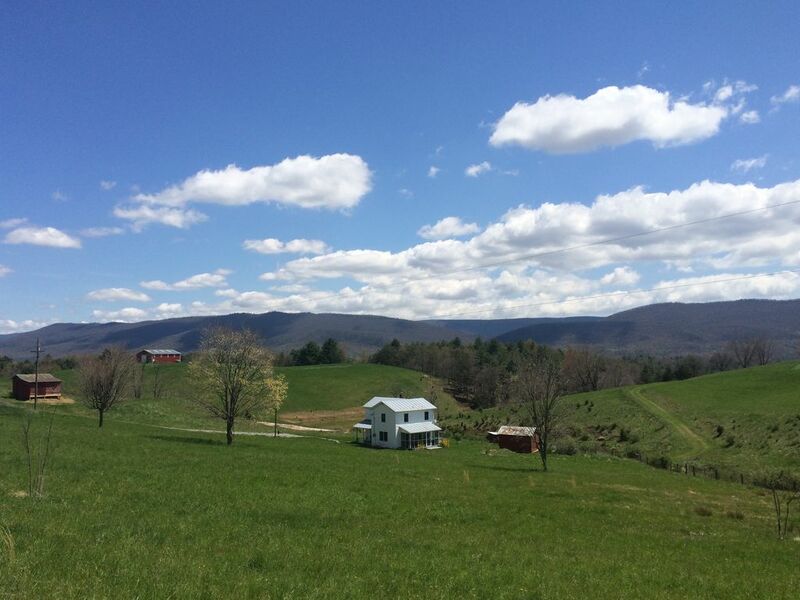 Looking for a place to let my creative muses flow, I found the most perfect spot nestled in the rolling hills of WV’s eastern panhandle highlands. The farmhouse, built around 1900, has been refurbished as a rustic cottage retreat with plenty of forethought to every detail that makes this dwelling so functional, convenient and modernized without sacrificing the original architecture or ambiance in any way. The quiet of the surrounding area should come as a welcomed respite for anyone like myself who dwells in an urbanized community. You can sit outside for hours with no sounds other than sometimes those of the contented cattle grazing on the hillside. I chose to come in winter which poses its own unique set of challenges but Eric and Brett have thought of everything one would need to insure an idyllic stay no matter what time of year is chosen. I never had to contact anyone with any problems for the entire week I stayed there and that alone speaks volumes to the preparedness that pervades Cold Comfort Farm. But if I had needed anything Eric had provided me with emails and phone numbers for both he and Brett plus a local lady who watches after the farm for them. I could go on and on about the extensive diversity of the local flora and fauna or the incredible view of the stars this place affords one at night, but instead I’ll sum it up with this...in a fast paced world Cold Comfort Farm is an oasis of preservation and retrospection with as many of the conveniences of modern life possible...but with no cell phone service or central heating (although excellent wi-fi is available). However those are both positive aspects for anyone looking to take a temporary break from the grid and who aren’t afraid to maintain a fire in an awesome wood stove. Plus they’re pet friendly too. Again I can’t say enough positive things about this farm. Book it. I don’t believe you’ll regret it. We spent an amazing couple of days in Eric and Brett's farmhouse. The house is incredibly well stocked and clean. The wood burning stove keeps the whole house warm but there's plenty of blankets and space heaters if needed. The instructions to access/ care for the property are super detailed and helpful. Would highly recommend this home to anyone looking to escape city living for some rest & relaxation! Great place for a relaxing getaway! We spent a wonderful Thanksgiving at Cold Comfort Farm. The location is great. It's not far from DC and it's a 5 minute drive to a beautiful state park with great hiking trails. The property was quiet and tranquil with plenty of space for our active dog to run. The house is very cozy and well-equipped with anything you might need, and even on nights with temps in the teens we stayed very warm with the wood-burning stove and the space heaters and electric blankets in every room. We were all sad to leave this beautiful spot and hope to go back one day. Fantastic property, very quiet, close to Lost River State Park. Had a blast with my sons. They doubted a house could be kept warm with a wood burning stove on a 20 degree night and cold weekend. Wrong! Great little place for a weekend away from technology, traffic and the burbs with loads of outdoor stuff to do or just hang out and play games or read. Strong recommendation. Misty Valley Hardware up the road. They made good sandwiches and had plenty of supplies. Recommend the Lost River Grill for lunch, great service and excellent burgers.